At the Figure Skating World Championship in Beijing, Russia’s national team performed more modestly than at the Olympic Games in Sochi, with Russia’s women being the only ones to show their form. Elizaveta Tuktamysheva took gold while Elena Radionova won bronze. 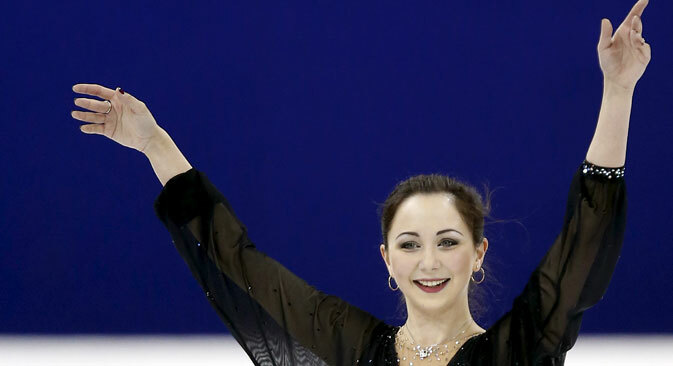 For 18-year-old Elizaveta Tuktamysheva, the recent Figure Skating World Championship in Beijing turned out to mark a watershed in her fledgling career: Not only did the young skater win gold, she also became the first Russian in the history of the event to execute a perfect triple axel jump. Tuktamysheva literally ran rings around her opponents. Following the short program the distance between her and the closest contender was more than eight points. The free skating event went off without a hitch and Tuktamysheva become Russia’s third women’s world champion in singles figures skating, after Maria Butyrskaya and Irina Slutskaya. Tuktamysheva’s success is not only the result of her many years of dedicated work, but also the consequence of the patience of her trainer, Alexei Mishin. Two years ago, when the young skater was clearly having a crisis (for this reason she had to give up on her dreams of the 2014 Olympics), practically everyone advised Mishin to focus on working with other pupils. Last fall, when Tuktamysheva returned to form, her critics were silenced. Back in December, immediately after her triumphal final at the Barcelona Grand Prix, Tuktamysheva confessed: “I fear a triple axel jump. I know very well in theory how to execute it, but theory is one thing and practice is quite another. There is a great risk of serious injury ...” And as early as February at the Bavarian Open, this element was included in the short program. She executed it, but fell when coming out of it. In Beijing, however, everything worked out much better. However, the championships in China turned out not to be such an easy ride for Russia’s other young talents on ice. Just last year, sixteen-year-old Anna Pogorilaya didn’t know what it was to participate in her first world championship (during the 2014 world championship in Saitama, Japan, there was a real commotion when she immediately took fourth place), in Beijing she had to experience her first difficulties. Even during the short program Pogorilaya had already made two errors. In the free skating program, the parade of errors continued to multiply. Russia’s second “Iron Babe,” 16-year-old Elena Radionova, also failed to hold her nerve during the free skating. But the points she picked up in the short program were enough to pull her through to a bronze medal when counting up the results of the two days of competition. For the first time since 2008, there were no Russian duets among the medalists, though some of the big names were absent. With two-time Olympic champions Tatiana Volosozhar and Maxim Trankov missing the tournament to let injuries heal and Olympic champions Ksenia Stolbova and Fedor Klimov concluding their season early in order to develop a more complicated repertoire, it fell to two veterans to represent the entire country: Yuko Kavaguti and Alexandra Smirnova. The duo came close to the medals, but three errors during the most important elements of the free skating program prevented Tamara Moskvina’s pupils from achieving these results. Optimists, incidentally, observe that Kavaguti and Smirnov were the best European couple at Beijing, and yesterday’s juniors Evgenia Tarasova and Vladimir Morozov came second among participants from the Old World. Russia’s individual performances were failures. Maxim Kovtun went to pieces in the short program (16th place), while Sergei Voronov skated well on the first day of competition (fourth place) but made too many errors on the second day. So the task of winning three tickets for Russia to the next world championship fell through: Kovtun took seventh place and Voronov came 13th. Russia’s dancers were also unable to win three tickets to the 2016 World Championships. Alexandra Stepanova and Ivan Bukin, who set the pace for the team at the European Championships by taking bronze, were unlucky in the short dance when Stepanova fell, hitting an uneven patch of ice. From 14th place they were only able to recover to ninth. Meanwhile, Elena Ilinykh and Ruslan Zhiganshin were victims of their lack of skating practice (the duet has been together for less than a year). While in the short dance their strength and skill was sufficient to enter the top five, in the free dance their imperfections knocked them out of the running, with the pair finishing in seventh position.